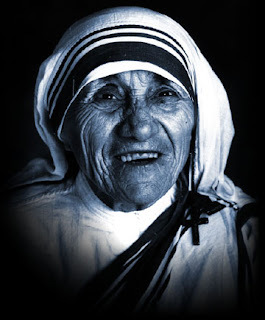 Mother Teresa was born Agnes Gonxha Bojaxhiu in Skopje*, Macedonia, on August 26**, 1910. Her family was of Albanian descent. At the age of twelve, she felt strongly the call of God. She knew she had to be a missionary to spread the love of Christ. At the age of eighteen she left her parental home in Skopje and joined the Sisters of Loreto, an Irish community of nuns with missions in India. After a few months' training in Dublin she was sent to India, where on May 24, 1931, she took her initial vows as a nun. From 1931 to 1948 Mother Teresa taught at St. Mary's High School in Calcutta, but the suffering and poverty she glimpsed outside the convent walls made such a deep impression on her that in 1948 she received permission from her superiors to leave the convent school and devote herself to working among the poorest of the poor in the slums of Calcutta. Although she had no funds, she depended on Divine Providence, and started an open-air school for slum children. Soon she was joined by voluntary helpers, and financial support was also forthcoming. This made it possible for her to extend the scope of her work. * Former Uskup, a town in the Ottoman Empire. ** Mother Teresa's date of birth is disputed: "So unconcerned was she about accuracy in relation to the chronicling of her own life, and so disinclined actually to read anything written about her, that for many years and in a succession of books her birthdate was erroneously recorded as 27 August 1910. It even appeared in the Indian Loreto Entrance Book as her date of birth. In fact, as she confined to her friend, co-worker and American author, Eileen Egan, that was the date on which she was christened Agnes Gonxha Bojaxhiu. The date which marked the beginning of her Christian life was undoubtedly the more important to Mother Teresa, but she was none the less actually born in Skopje, Serbia, on the previous day." (Spink, Kathryn: Mother Teresa: A Complete Authorized Biography, HarperSanFrancisco, 1997.